Ever since I posted this graphic on our social media site yesterday, it has been on my mind. Oftentimes, if we are generally feeling pretty good (with no real sense of dis-ease) we go about our days thinking we are doing ok. We may have trouble sleeping now and again, a little indigestion now and again, maybe some low energy and a few aches and pains as we get out of bed in the morning, but generally, we feel that we are not doing too badly ( especially considering some of the things we could be dealing with). But I do think many of us could feel so much better. I know that I have not yet reached my “feel good” potential. I do know though that I feel better now ( close to 50 – yeah!) then I did when I was in my 20s (hobbling along with occasional SI pain, a chronic sore neck and not eating quite as healthy as I am now (most of the time J ). I have always believed that food is medicine ( and nutritional research keeps proving this ). Once you combine the proper nutrients in your body, throw in some daily movement ( moving often and in different ways) and an attitude of gratitude you have a recipe for feeling pretty great. However, it does take a little bit of experimenting with the foods that work best for you ( taking in to consideration food intolerances or allergies, proper portions for energy and digestion, and the right combination of foods to get all of your vitamins and minerals. Sometimes it takes a bit of time, research and experimenting but it is soooo worth the effort. And, summer is the best time to “play”. So enjoy the bounty at the Farmer’s Market, walking, running, biking or rollerblading on the the Stato Trail & Boardwalk and all of the amazing activities on our lakes and in our Parks. 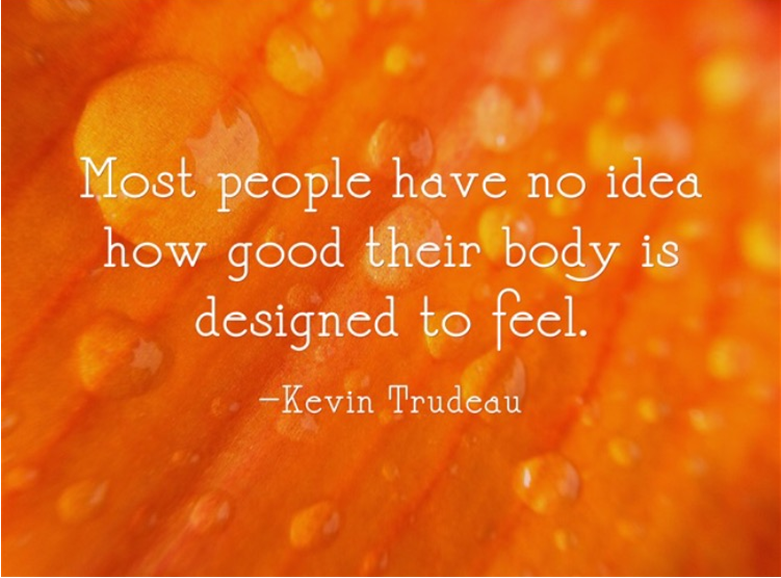 Let’s all find out how good we can really feel!! Using rice crackers or rolled quinoa instead of bread crumbs in the recipe makes it easier to digest and prevents you from feeling bloated. 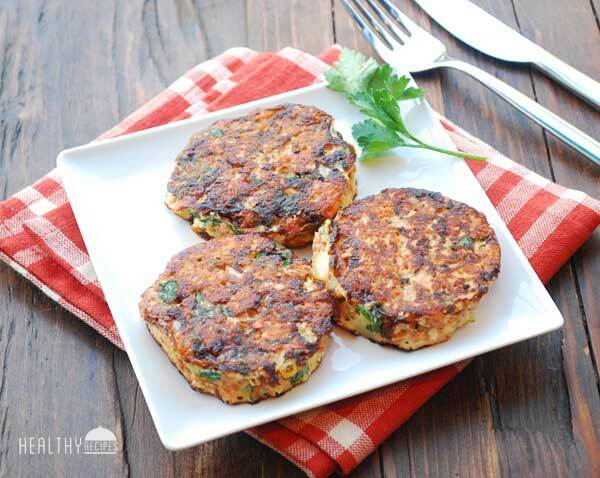 Serve these patties with a large green salad. You can also skip making the patties omitting the egg and crackers/quinoa and instead make the salmon mixture over a bed of salad greens. Heat 1 teaspoon (5ml) of oil in a small skillet over medium heat. Spritz liberally with filtered water or broth to ensure the oil doesn’t overheat. Add the onion and celery and sauté for 4 minutes or until tender. In a medium sized bowl, combine the onion mixture with the salmon, egg, ½ cup of the (125 ml) crushed crackers, dill and mustard. Divide the salmon mixture into 4 equal portions, using your hands to shape each into a ½ inch thick patty. Put the remaining ¼ cup (60 ml) of crushed rice crackers or rolled quinoa on a plate. Coat each patty with 1 tablespoon (15 ml) of crushed crackers. Heat the remaining 2 teaspoons (10 ml) of olive oil in the same skillet over medium heat. Cook the patties for 5 minutes on each side, until lightly browned. Allergy Reducing Tip: Egg Substitute: 1 tablespoon (15 ml) freshly ground flax seed and 3 tablespoons (45 ml) filtered water in a blender or food processor, blending until the mixture is thick and creamy. Hey everyone, if you are pregnant or know someone who is, this link gives a great overview of what Pilates exercise can do for you during your pregnancy. Teaching Prenatal Pilates has always been one of my favourite things at Balanced Motion. Many of the moves are closely related to Yoga, but with the Pilates exercise principles: centering, concentration, control, precision, breath and flow. The feedback I’ve had from clients fits right into this article. My hope is that this link will let as many people as possible know how great Pilates can help them feel during their pregnancy. Click here to read article. 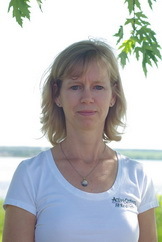 Lisa is a Certified Pilates Instructor with special training in Pre and Post-Natal Pilates. 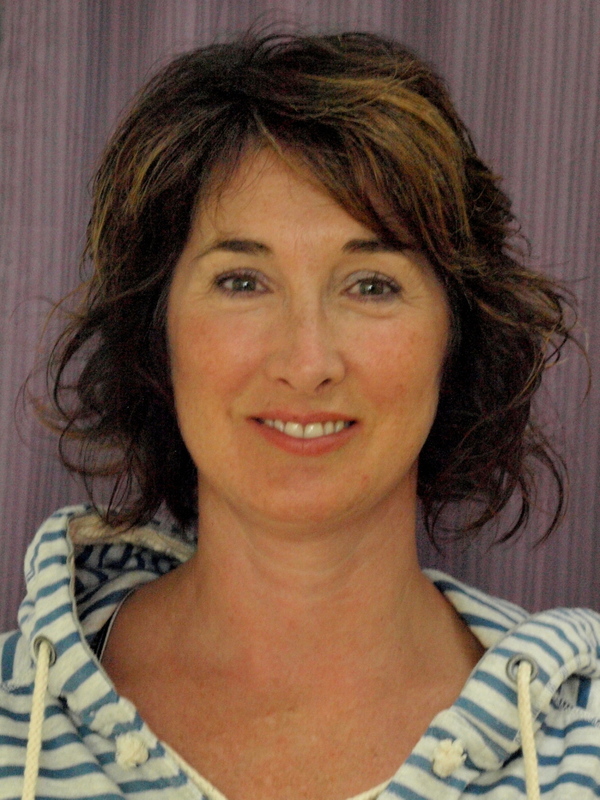 She co-owns Balanced Motion Pilates and Yoga. Here in our small community, I am constantly amazed at the depth of knowledge that shows up. In my work at Balanced Motion Pilates and Yoga I feel lucky to get to meet and chat with so many different people… part of what I love about this work. Often, clients and colleagues present new links and insights into the community, both with events, networks and services. Word of mouth has always been an excellent way to promote things here. So when my friend and colleague Dr. Crystal Briand (and her team at Gravity Chiropractic) and I got to comparing notes about services offered to moms-to-be as well as new moms, we realized there is a lot going on in our fair community. Some of which is not obvious to everyone…. But we have some very dedicated, skilled and talented professionals locally who want to help expecting moms, new moms and babies have the best experience and advantage throughout this time of life. 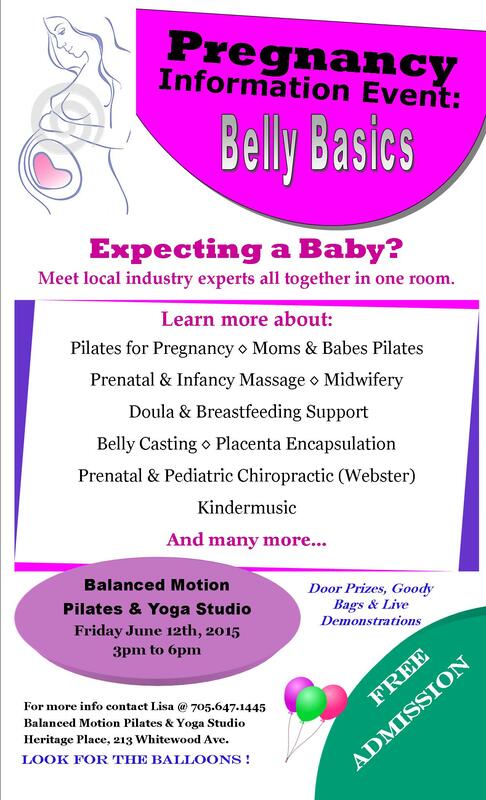 In honour of this population, Balanced Motion Pilates and Yoga together with Gravity Chiropractic are putting on an Information Event: Belly Basics on Friday June 12th from 3-6 pm. 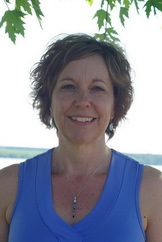 Located at Balanced Motion (213 Whitewood Ave, Heritage Place, New Liskeard). At this event you will meet people who offer special prenatal and pediatric chiropractic techniques, infant massage, pregnancy massage, exercise techniques for during pregnancy and afterward, pelvic floor physiotherapy, midwifery, doula and breast feeding support, belly casting, placenta encapsulation, Kindermusic, family counselling and more. To see the poster, click here. So if you are pregnant, have a new baby or know someone who does, I urge you to spread the word and join us for a fun and informative few hours dedicated to pregnancy, childbirth and baby services. We will have door prizes, goody bags and live demonstrations. It should be great!! See you there! In a medium skillet over medium heat, cook peameal bacon until evenly brown. Drain, cool, and cut up. To make the dressing, thoroughly blend the vinegar, honey, dry mustard, paprika and olive oil. 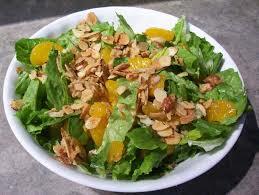 Place lettuce, oranges, green onions, peameal and almonds in a serving bowl. Toss with dressing and serve immediately. Happy long weekend Friday Peeps! As promised in my Blog on Wednesday here is a great article on alcohol from calorie secrets. This article has some great ideas on how to cut down on the calories & sugar so you don’t derail your whole day of healthy choices with one drink. Click here to check it out. Hello long weekend! The first weekend to kick off spring/summer has finally arrived, yah!!! Our yard work has started, boats are going in the water, cottages are getting opened, BBQ’s are being fired up and with that comes more socializing. Getting together with friends and family to share a great meal on the back deck or at the cottage is often part of our summer fun and this can include a few social drinks. For those of us choosing to live a balanced lifestyle a few bevvies can often derail our whole day of healthy choices. Alcohol is high in calories and sugar at 7 calories per gram so for a standard drink of 10 grams that’s 65 calories and you have not added any mix yet! A regular beer has approximately 149 calories, liqueurs such as Drambuie have 188 calories, cocktails anywhere from 140 calories for a Martini to 488 calories for a chocolate Martini, ouch that hurts! So that being said how do we find balance in our choices? One of my favourite drinks in the summer is Gin and tonic but the tonic is loaded with sugar let alone the gin, giving me a lot of empty calories that I don’t want. 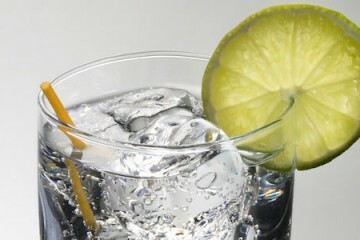 So I switched to carbonated water 0 calories with a twist of lime, I have even used lime flavoured water on occasion. Since I don’t eat a lot of sugar it still tastes great without all the sugar and extra calories. Try 2oz wine cut with 4oz carbonated water for a refreshing white or red wine spritzer! Stay tuned for the Friday education piece this week for more great tips on how to make better choices regarding those summer bevvies. 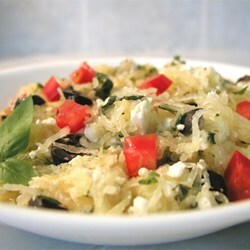 Place spaghetti squash with cut sides down in dish with ½ inch water, and bake 30 minutes in the preheated oven, or until a sharp knife can be inserted with only a little resistance. Remove squash from oven and set aside to cool enough to be easily handled. Meanwhile, heat oil in a skillet over medium heat. Cook and stir onion. Add garlic; cook and stir until fragrant, 2 to 3 minutes. Stir in tomatoes and cook until tomatoes are warmed through. Snacks, who doesn’t love a good snack…. eating a healthy nutritious snack is a top priority of mine. 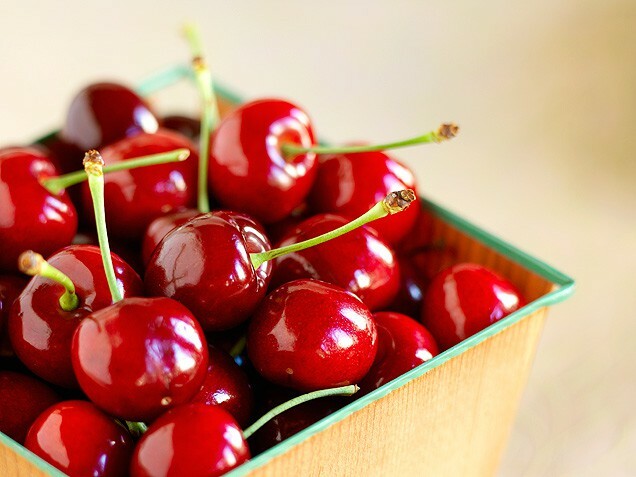 Whether we need to snack or not have always been up for debate… If you feel you need to have a little “treat” in between meals, click here to read a great article with a few healthy options for snacking from Mind Body Green. should get a bad “rap” but let’s stop this silliness and dig a little deeper in to this issue of snacking. consider that it is not just about what you are eating but when you are eating. like to choose an evening snack (30-60 minutes before bed) that prepares me for a good night sleep. consistency in the bullet or blender)…yum! crazy when I call a granola bar a “treat” but I call it as I see it). So, love to hear your thoughts and comments.